As you are already aware, the UK has now moved from the old "analogue" broadcasting of TV channels, to the new "digital" system. This new system allows many more channels to be broadcast to you, with a much higher picture quality. The same has also happened in France. 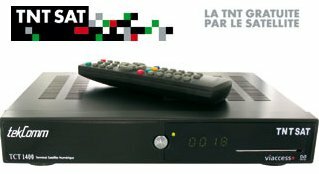 The UK call it "Freeview", here in France it is known as TNT which is "télévision numérique terrestre". With the TNT system there are around 27 digital free to view channels available via a satellite dish and digibox (as shown below). To offer you a greater service we can supply and install equipment to receive these French digital channels. To keep costs down it can be installed at the same time as your UK system. It does not matter whether you have an older style analogue television or a new digital one - this new service will work with either. A list of the currently available French channels is shown below. These are the equivalent of our mainstream BBC and ITV channels and are available without a subscription.